Meet the twins, 2 kitties in one, like Doublemint gum, two mints in one!! Remember those commercials from your childhood. Meet Molly and Milo. Molly is in front. These two siblings love to hang together. They are like peas in a pod! Both kitties are awesome with kids and dogs. They are used to large dogs and grade school kids, and a house with a huge amount of activity. The foster finished Christmas tree training successfully, with no bulbs broken. LOL. Molly and Milo enjoy cat towers to chase each other around on and to crash once playing has tired them out. They like interactive toys. No worries, we will send you pictures of toy preferences when you adopt them. They use horizontal scratch pads very well, no furniture scratching happening with these two. Molly and Milo will provide many smiles and laughter as the are always up to antics of kittens through and through. When one starts running and playing the other one is not far behind. Molly and Milo are combo checked, negative for FIV and FeLV, spayed and neutered, vaccinations are current, and of course they are microchipped. Contact us for an adoption application. Once the application is completed & returned to us; we will gladly set up and 'meet and greet' date. These two won't disappoint. 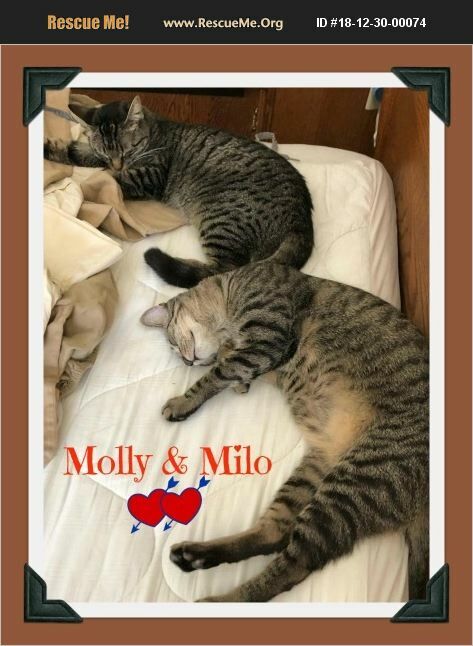 Our kitties are normally $125 each, adopt Molly and Milo together; we reduce the price to $225, $25 discount for the Valentine's day! We offer a two week trial to make sure they are a good fit for your home and lifestyle. We don't want you to keep them if you are not falling hopelessly in love with them. Thank you for viewing our rescue kitties! We appreciate you!